The European head of States and Governments hold an informal meeting to discuss the future of the European Union after Brexit. 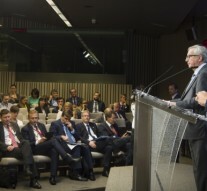 On 28 and 29 June, the European Council, composed of all head of States and Governments from EU, gathered in Brussels in order to discuss the political consequences of the UK referendum. The leaders also had an informal meeting to debate the future of the European Union with 27 Member States. Prime Minister David Cameron presented the situation in the country after the vote and declared his intention not to trigger article 50 of the Treaty on European Union. This important decision will be taken instead by the new leadership of the United Kingdom. Other pressing issues were also addressed during the meeting, such as the migratory crisis, deepening of the single market to increase growth and jobs, and the security of the EU in close cooperation with NATO. In the evening, the 27 heads of state or government discussed the political and practical implications of ‘Brexit’ in an informal meeting. “Certainly one issue is clear from our debate. Leaders are absolutely determined to remain united and work closely together as 27,” said President Tusk at the press conference after the meeting. A debate on the future of the European Union was also started by the European leaders, who planned to meet again to continue talks on 16 September 2016 in Bratislava. Britain’s withdrawal from the European Union must be orderly, the leaders reconfirmed. In particular, President Tusk reassured that: “There will be there will be no negotiations of any kind until the UK formally notifies its intention to withdraw.” He also expressed hope to have the UK as a close partner in the future. The European Council also took into account the economic situation after Brexit in the presence of the European Central Bank President, who reassured on the good and constant cooperation of central banks. Yet, it was also made clear that Brexit will substantially reduce growth in the UK, with a possible negative spillover worldwide. Tomorrow, a first informal meeting without the UK will be held among the 27 Head of states and governments, who will have a reflection process to give an impulse on the future of the EU. Although the UK Prime Minister was not allowed to participate in the discussions besides those on Brexit, the gathering was very much a British European Council, because most of the other issues discussed were also “British”. Leaders took important decisions on the single market, the digital market, the capital markets union, on stemming irregular migration and on closer cooperation with NATO. They came to an agreement on stepping up work with African countries on returns of irregular migrants, and on measures that would stabilise the situation in Libya. Ahead of the Warsaw Summit EU-NATO, co-operation was discussed in the presence of Secretary General of NATO, Jens Stoltenberg. Given unprecedented challenges from the South and East, all leaders involved in the discussion agreed on the necessity to enhance relationship between the two organisations. They also decided on further steps to make the Single Market deeper, especially in terms of digital market. They also agreed on continuing to develop the capital markets union despite the recent turmoil. « Previous Article What is the role of American elections for the EU?